Synopsis: Pirate Captain sets out on a mission to defeat his rivals Black Bellamy and Cutlass Liz for the Pirate of the year Award. The quest takes Captain and his crew from the shores of Blood Island to the foggy streets of Victorian London. Review: Still a kid at heart, I secretly love being able to see animated films and enjoy them through the eyes of an adult. I’ve no problem finding time to see a PIXAR film with the same verve that I have for the newest R-rated action blockbuster because there’s the same great escapist entertainment to be had in the world of animation. The animators at Aardman have long been a favorite of mine thanks to their pioneering work with stop-motion animation and their creation of the Wallace and Gromit characters. This year when the Oscars were announced I found there was only one film among the five films selected as Best Animated film nominees that I hadn’t seen and it just happened to be Aardman’s latest effort, The Pirates! Band of Misfits. I missed this one on several occasions in the theater and after seeing the film I regret not taking advantage of seeing the movie on the big screen with the added bonus of 3D technology. It’s one of the strongest nominees and could just find itself with the Oscar when the big night rolls around. The film starts off in a fairly standard way and I was just settling in for what I thought would be a familiar story when the movie pulled a nice switcheroo and turned a standard plot line on its head. What begins as a tale of a dippy Pirate Captain and his rag-tag crew entering the Pirate of the Year Awards quickly veers into creative territory involving exotic animals, adventure on the high seas, and a few run ins with a very disagreeable Queen Victoria. Along the way there are ample amounts of laughs and superior displays of creativity that have become the standard calling card of the folks at Aardman. As the Pirate Captain, Hugh Grant (Cloud Atlas) doesn’t rely on his proper stutter and stammer but instead uses a light air to suggest that our hero isn’t as aware as he should be. This Pirate Captain is lovably clueless, making for a winning combination when teamed up with his faithful band of misfit pirates with great names like The Albino Pirate, The Pirate with Gout, The Surprisingly Curvaceous Pirate, and The Pirate with a Scarf voiced nicely by Freeman (the current Bilbo Baggins in The Hobbit: An Unexpected Journey). A few historic characters pop up as supporting players like Charles Darwin who is reinvented as a lovesick dweeb with a thing for Vicki (that’s Queen Victoria to you commoners) who won’t give him the time of day. It’s the Queen Victoria character that made me laugh the most — given new life by Aardman as a scheming villainess and voiced with prim steeliness by Staunton. This Queen is no slouch — director Lord and screenwriter Gideon Defoe (who wrote the source book) make her nice and nasty without ever utilizing any truly mean jabs. 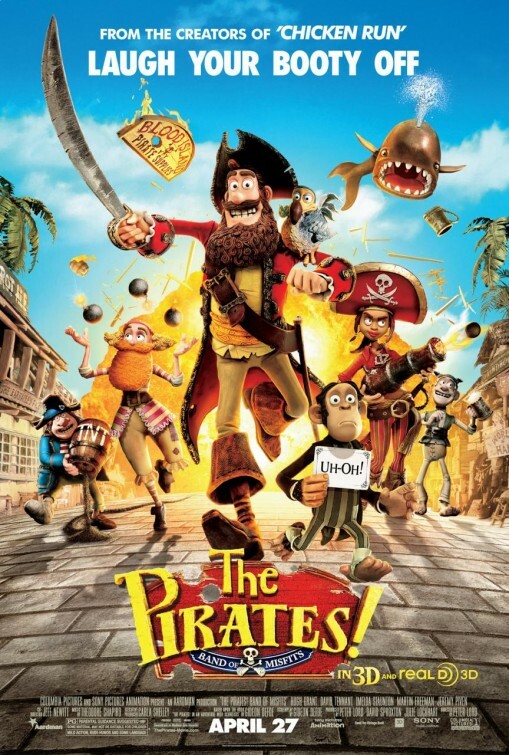 Like the other nominees (Brave, Frankenweenie, ParaNorman, and Wreck-It Ralph), The Pirates! Band of Misfits has a lot of heart in its themes of loyalty and friendship that won’t be lost on youngsters and grown-ups that view it. The blend of stop-motion and computer animation is seamless and beautifully detailed…showing that Aardman gets better with each film they produce. A worthy nominee for Oscar glory, this is an easy-going fantasy adventure with enough visual gags for kids and laughs for adults.